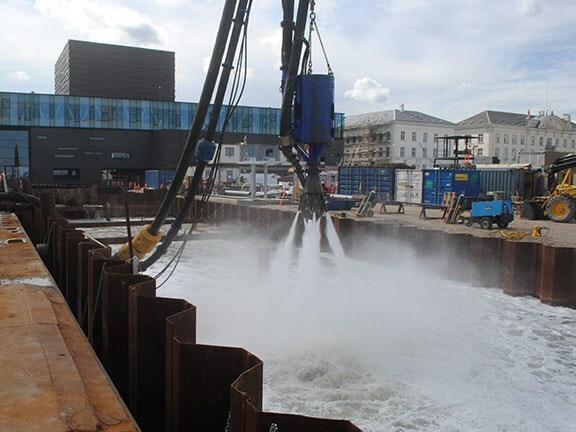 The BBA BA-C200S8 jetting pump being used for underwater excavation in Copenhagen. While most of us do our best to keep excavations free of water, BBA Pumps is using jetting pumps such as the BA-C200S8 for the underwater excavation of purposely flooded sites. "With the ‘flooded excavation principle’, the construction site is flooded after the retaining walls have been installed," BBA says. "When the excavation is in layered soils facing artesian pressure and confining layers, the weight of the water compensates for the topsoil being removed and prevents failure of the base of the excavation." Flooded excavation may be the easiest option when it is difficult to install pump systems, or when reducing the artesian pressure is impossible or undesirable, the company says. Rather than using earthmoving equipment, the actual digging is done with a submersible pump that is suspended from an excavator or crane. Jetting nozzles on the submersible pump agitate the soil, creating a slurry that can be pumped away, thereby digging out the soil. When the intended depth is reached, underwater concrete is poured to create a watertight base that will create a caisson in combination with the retaining walls already installed. "In the pictures you see a perfect example of such a project being conducted in the port area of Copenhagen (Denmark)," BBA says. "In order to install a three story parking basement the contractor is excavating down to a level often meters below sea level." The jetting pump used to power the nozzles is the BA-C200S8 jetting pump, which has a maximum flow of 1,250 cubic metres an hour and a maximum pressure of 135 mwc. 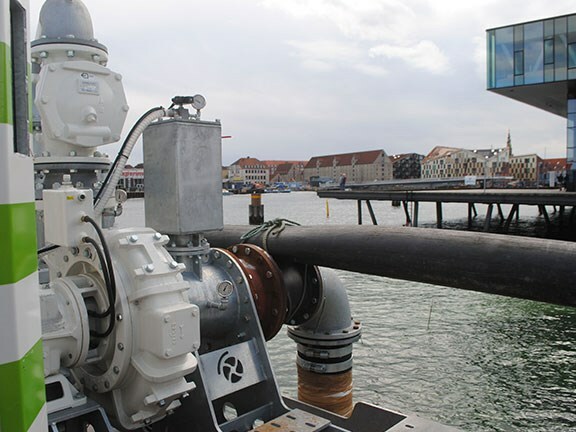 BBA says this high-powered jetting pump will run at a very high efficiency rate of 82 percent in the duty point and is "powered by the cleanest Stage IV final diesel engine in its class" — the Volvo Penta TAD1375VE. Features include a super-silent canopy, remote control, integrated flood lights, certified lifting points and LCD CAN-BUS control panel. "Although a niche market, this dredging technology offers many benefits in specific situations," BBA says. "As the method requires a minimum amount of earthmoving equipment the excavation can be done quickly and safely without any major disruptions to day-to-day life in the city." Click here to find BBA pumps for sale.